Two goals from John Marquis all but consigned Scunthorpe to League One and kept Millwall in the hunt for a play-off place. The Lions went in front when Marquis tapped in James Henry's cross. A mistake by Eddie Nolan set up Marquis's second, the full-back heading straight to the striker, who fired in from the edge of the area. Michael O'Connor got a consolation goal for Scunthorpe from the penalty spot after Darren Ward fouled Joe Garner. Crystal Palace's victory against Leeds leaves United six points behind the Eagles with a significantly inferior goal difference and just two matches remaining. Just one defeat in four games had raised Scunthorpe hopes that they could avoid the drop, but Marquis, only leading the line in the absence of Steve Morison, Neil Harris and Kevin Lisbie, made almost certain that they will start next season in the third tier. For Millwall, the win leaves them two points behind sixth-placed Nottingham Forest with two games to play. The Iron made a positive start and Michael Collins fashioned a chance to open the scoring after nine minutes but the midfielder's curled effort from an acute angle flashed past the far post. In-form midfielder Ramon Nunez tried his luck from long range but the Honduras international's drive flew over Lions goalkeeper David Forde's crossbar. Scunthorpe remained on the front foot and left-back Marcus Williams burst into the penalty area but shot straight at Forde, who palmed the ball away. Millwall started to get into their stride and the lively Andros Townsend let fly with a strike from 30 yards out, but Joe Murphy made the save. Seven minutes before half-time, the Lions were in front. James Henry teed up Marquis, who was left with the simple task of tucking home from a yard out. The visitors were fortunate, but they could have been further ahead before half-time had Michael Nelson not produced a timely block to deny Henry. But the Londoners doubled their lead five minutes after the break after a mistake from Nolan. The defender headed straight to Marquis and the striker made him pay with a first-time strike from the edge of the area that gave Joe Murphy no chance. Scunthorpe were given hope four minutes from time when Ward brought down Garner and O'Connor tucked home the resulting spot-kick. But Millwall were not troubled after that as they secured three vital points towards their push for the play-offs. 90:00+3:38 The referee brings the game to a close. 90:00+2:35 The ball is crossed by Ramon Nunez. 90:00+0:21 Substitution Darren Purse on for Andros Townsend. 90:00+0:21 Shot from just outside the box by James Henry misses to the left of the target. 89:44 Marcus Williams produces a cross. 87:41 GOAL - Michael O'Connor:Scunthorpe 1 - 2 Millwall Power penalty scored by Michael O'Connor. Scunthorpe 1-2 Millwall. 86:15 Shot by Ramon Nunez. Jack Smith gets a block in. Corner taken right-footed by Bobby Grant from the right by-line, Darren Ward challenges Joe Garner unfairly and gives away a Penalty. 84:59 The assistant referee signals for offside against Chris Dagnall. David Forde takes the indirect free kick. 79:58 Michael O'Connor sends in a cross, save by David Forde. 79:47 The ball is delivered by Michael O'Connor, Darren Ward manages to make a clearance. 78:37 Bobby Grant produces a right-footed shot from outside the penalty box and misses right. 78:10 Hameur Bouazza is ruled offside. Marcus Williams takes the indirect free kick. 77:33 The assistant referee flags for offside against Hameur Bouazza. Joe Murphy takes the indirect free kick. 77:19 James Henry has an effort at goal from 18 yards. Sam Togwell gets a block in. 75:33 Substitution Danny Schofield replaces John Marquis. 75:33 Substitution Josh McQuoid leaves the field to be replaced by Hameur Bouazza. 75:33 Shot from outside the box by Bobby Grant misses to the left of the goal. 74:23 Marcus Williams crosses the ball, clearance by Paul Robinson. 73:40 Sam Togwell gives away a free kick for an unfair challenge on Tamika Mkandawire. Free kick crossed by Tony Craig. John Marquis produces a cross, save made by Joe Murphy. 72:08 Michael O'Connor produces a left-footed shot from outside the penalty box and misses left. 71:08 Joe Garner concedes a free kick for a foul on Darren Ward. David Forde restarts play with the free kick. 70:48 James Henry has a shot on goal from outside the box which misses left. 70:04 Shot from 35 yards by Bobby Grant went wide right of the post. 68:16 Andros Townsend concedes a free kick for a foul on Michael Collins. The free kick is delivered right-footed by Michael O'Connor from right wing, David Forde makes a save. 66:23 Chris Dagnall has an effort at goal from outside the penalty box which goes wide right of the target. 65:08 Michael Nelson fouled by John Marquis, the ref awards a free kick. Joe Murphy takes the direct free kick. 64:25 The offside flag is raised against Joe Garner. David Forde restarts play with the free kick. 63:13 Shot by Bobby Grant from outside the box goes high over the target. 61:49 Substitution Mark Duffy leaves the field to be replaced by Bobby Grant. 61:49 Substitution Michael O'Connor replaces Eddie Nolan. 59:32 Handball by Nadjim Abdou. The free kick is swung in right-footed by Eddie Nolan. 59:12 The ball is crossed by Eddie Nolan, clearance by Tony Craig. Correction - 56:42 Sam Togwell delivers the ball, blocked by Paul Robinson. Corner taken by Mark Duffy, clearance made by Darren Ward. 56:42 Sam Togwell delivers the ball, Paul Robinson gets a block in. Corner taken by Mark Duffy from the left by-line, clearance made by Paul Robinson. 55:50 A cross is delivered by James Henry, Michael Nelson makes a clearance. 54:53 Joe Garner crosses the ball. 53:03 Free kick awarded for a foul by Nadjim Abdou on Joe Garner. Ramon Nunez produces a strike on goal direct from the free kick. The assistant referee signals for offside against Joe Garner. Indirect free kick taken by David Forde. 52:38 Centre by Josh McQuoid, Headed effort from inside the area by John Marquis misses to the left of the target. 50:44 GOAL - John Marquis:Scunthorpe 0 - 2 Millwall A goal is scored by John Marquis from the edge of the penalty area to the bottom left corner of the goal. Scunthorpe 0-2 Millwall. 49:58 Drilled left-footed shot by Chris Dagnall. Tamika Mkandawire gets a block in. Corner taken right-footed by Mark Duffy from the right by-line, save made by David Forde. 48:09 The referee blows for offside. The free kick is delivered right-footed by Michael Collins from own half. 47:29 Outswinging corner taken by Mark Duffy, Chris Dagnall produces a cross, clearance by Nadjim Abdou. 46:21 Eddie Nolan gives away a free kick for an unfair challenge on Josh McQuoid. Andros Townsend takes the free kick. Unfair challenge on Andros Townsend by Mark Duffy results in a free kick. Free kick crossed right-footed by Andros Townsend from left wing, Michael Nelson makes a clearance. 45:00+2:09 The players leave the pitch at half time. 45:00+1:34 The ball is delivered by Sam Togwell. 45:00+0:38 Shot from long distance by Andros Townsend goes wide of the left-hand post. 43:59 Foul by John Marquis on Michael Collins, free kick awarded. Free kick crossed right-footed by Mark Duffy, Tamika Mkandawire makes a clearance. 43:52 Marcus Williams delivers the ball, Jack Smith makes a clearance. 43:23 James Henry takes a shot. Sam Togwell gets a block in. 42:43 A cross is delivered by Josh McQuoid. 42:08 Effort on goal by James Henry from 20 yards. Michael Nelson gets a block in. 40:05 Jack Smith crosses the ball, save by Joe Murphy. 39:55 The ball is swung over by Tony Craig, David Mirfin makes a clearance. 38:07 James Henry provided the assist for the goal. 38:07 GOAL - John Marquis:Scunthorpe 0 - 1 Millwall A goal is scored by John Marquis from close in low into the middle of the goal. 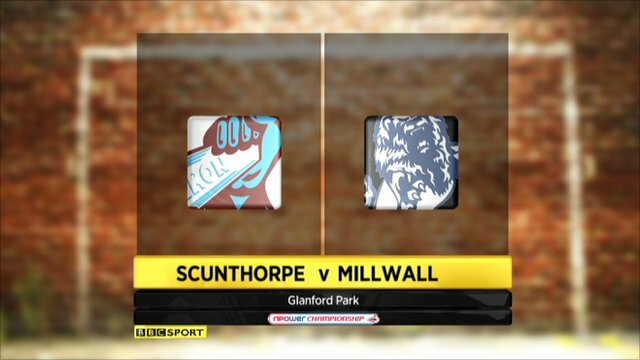 Scunthorpe 0-1 Millwall. 37:33 Andros Townsend sends in a cross, David Mirfin makes a clearance. 36:18 Marcus Williams is flagged offside by the assistant referee. Free kick taken by David Forde. 35:20 The assistant referee signals for offside against Josh McQuoid. Joe Murphy takes the free kick. 34:53 The ball is swung over by Josh McQuoid, Michael Nelson manages to make a clearance. 34:20 Chris Dagnall is caught offside. David Forde restarts play with the free kick. 33:55 Jack Smith concedes a free kick for a foul on Joe Garner. Mark Duffy takes the direct free kick. 32:59 The ball is crossed by Andros Townsend, blocked by Marcus Williams. 32:34 The ball is sent over by Mark Duffy, clearance by Darren Ward. 30:32 The ball is sent over by Sam Togwell, blocked by John Marquis. Outswinging corner taken by Mark Duffy, John Marquis makes a clearance. 29:25 John Marquis delivers the ball. 27:56 Chris Dagnall has a shot on goal from outside the box which misses right. 24:58 Marcus Williams crosses the ball, clearance made by Darren Ward. 24:36 Free kick awarded for an unfair challenge on Joe Garner by Darren Ward. Sam Togwell restarts play with the free kick. 23:12 Foul by Joe Garner on Jack Smith, free kick awarded. Jack Smith restarts play with the free kick. 22:51 Shot from 30 yards from Andros Townsend. Joe Murphy makes a save. 21:01 Marcus Williams gives away a free kick for an unfair challenge on John Marquis. Andros Townsend delivers the ball from the free kick left-footed from right wing, Michael Nelson makes a clearance. 20:13 Marcus Williams challenges Jack Smith unfairly and gives away a free kick. The free kick is delivered right-footed by Jack Smith from right wing, David Mirfin makes a clearance. 18:48 The ball is sent over by Josh McQuoid. 17:58 Free kick awarded for a foul by Joe Garner on Paul Robinson. Free kick taken by David Forde. 16:53 Chris Dagnall has a drilled shot. Paul Robinson gets a block in. 15:51 James Henry fouled by Sam Togwell, the ref awards a free kick. James Henry takes the free kick. 15:09 The ball is crossed by Michael Collins. 14:51 Shot from 12 yards by Marcus Williams. David Forde makes a save. 13:22 Free kick awarded for an unfair challenge on Joe Garner by Paul Robinson. Marcus Williams takes the free kick. 12:40 Effort from just outside the area by Ramon Nunez goes over the bar. 9:18 Michael Collins has an effort at goal from just inside the box that misses to the right of the target. 8:47 The ball is delivered by Eddie Nolan. 7:43 Free kick awarded for an unfair challenge on Michael Nelson by John Marquis. Direct free kick taken by Joe Murphy. 6:10 A cross is delivered by Marcus Williams, blocked by Jack Smith. 4:11 Joe Garner is caught offside. David Forde takes the free kick. 3:23 Long range shot by Jack Smith goes wide right of the goal. 2:59 Foul by Joe Garner on Tony Craig, free kick awarded. Free kick taken by David Forde. 2:10 Ramon Nunez produces a cross. 0:38 Effort on goal by Mark Duffy from just outside the penalty area goes harmlessly over the target.